Low-voltage lighting adds another dimension to your overall landscape design, providing lighting for outdoor use areas and light pathways and steps. 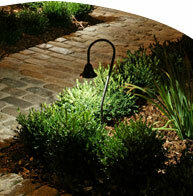 Custom lighting plans accent your key features and add nighttime illumination for increased beauty and safety. We'll even add low-voltage lighting to your water feature for added decorative effect. Need some bright ideas? See these case studies for inspiration. Outdoor Lighting services include lighting design plans, complete installation, and maintenance options.